Someone asked me a favor - please videotape yourself knitting a scarf with a ripple effect. I assumed that the person meant a lacy pattern that creates a beautiful wavy effect. My mom used to knit sweaters for her friends' babies and used this pattern. So I go back many years in my memory. Don't ask me how many. LOL. But as a child I remember looking at these beautiful baby sweaters with a wavy design that had design holes in them - they were beautiful. My mother was a great knitter and crocheter. People asked her to knit something for their children or them all the time. So, I started knitting this scarf, and videotaping..... Usually it takes me less time, but I was watching movies while I was knitting. And guess what happened.... YES! Of course, I had to re-knit my scarf several times. What I mean is that I had to frog it to the area where I made a mistake and re-knit from that area entire section again. Just because I got immersed into the movie. I didn't learn from my mistake - I watched another really intense movie the next day, and what do you think happened? I knitted several inches - I would say about 12 - and I realized I had so many errors in my scarf, that entire evening's work was good for nothing - I had to rework the entire part the next day AGAIN!!!! So, if you have to count your stitches (which you have to with any lacy project), DO NOT WATCH MOVIES! TRUST ME! I used Paton's "Classic Wool", which is medium weight/thickness, but you can use any medium weight #4 yarn/wool of your choice and your favorite color. On the label is information what knitting needles you should use. Use any yarn you want with the suggested needles and you will create your own "one of the kind" scarf. 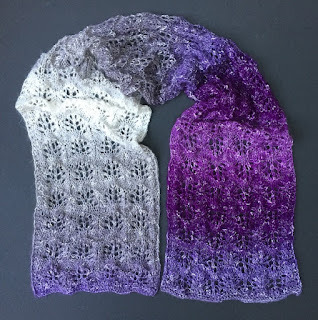 TUTORIAL VIDEOS "how to Knit this scarf"
This scarf uses multiples of 18 sts. So if you want to make it even wider - add as many times 18 sts as you desire. You could turn it into a baby blanket with 9+ multiples. Below is a pattern for 2 (3, 4) "multiples of 18 sts". Repeat Row 5-8 (in bold) as many times as needed, until desired length of your scarf. 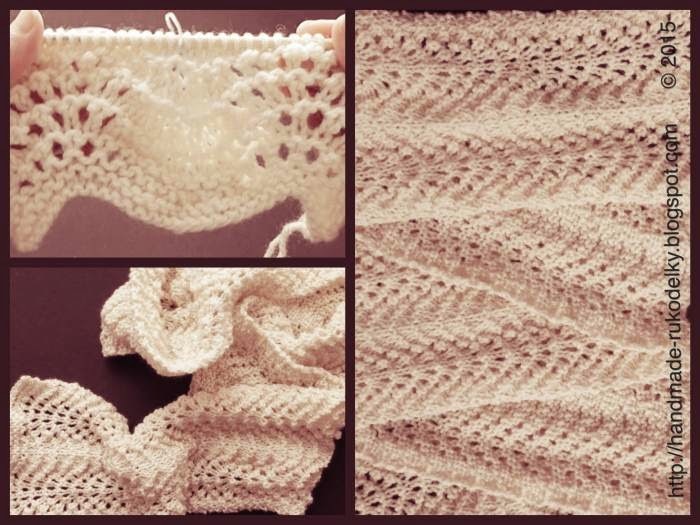 Leave about 20 feet for the last 6 rows to finish your scarf. Weave in both ends. Add fringe if desired. Block if needed.